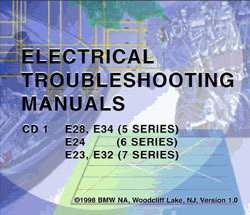 In the program Electrical Troubleshooting Manual E28 1982-86, E34 1989-95, E24 1983-89, E23 1982-87, E32 1988-94 the full information on all electronics of the automobile is submitted. All electric circuits on E28 1982-86, E34 1989-95, E24 1983-89, E23 1982-87, E32 1988-94, with the left and right rudder, the European and American markets. The information is submitted in many languages - Deutsch, English, Francais, Italiano, Nederlands, Espanol, Svenska.